Suspension is the key! Yes that’s right put springs on your shoes. Well, not quite, but while on the subject of shoes you need to make sure you use one with good shock absorption qualities – stay away from running flats, they don’t have the support and absorption qualities to be kind to your joints. In any event they are only meant for shorter endurance events. Anyway, I really mean suspension for the bike. 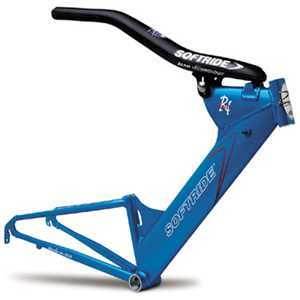 Softride are the most well known suspension beam bikes. I’ve included a couple of their frames below. There are variations on this type of design. Zipp had a beam bike too, originally they used the Softride suspension beam (originally called the Allsop suspension beam), but they moved to a different beam but it still would provide shock absorption. Trek too have a suspended beam design bike, this is their Y66 model for triathlon, which no longer appears to be marketed, though it may still be available as a special order. 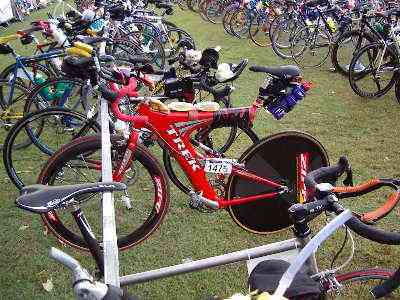 The Trek Y66 Trek now market their Hilo range as triathlon specific. 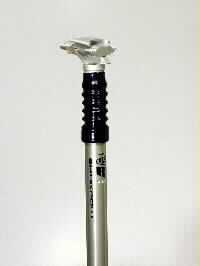 It is not necessary to go to the expense of changing frames to get suspension, as there are now a range of quality lightweight suspension seat posts. 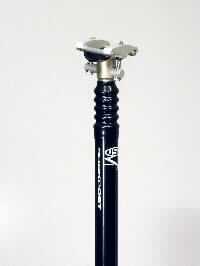 Both USE and RockShox make good suspension posts, both road versions come in at around 300g. If anything USE’s is a shade lighter. I actually train on a Softride and race on a Trek OCLV carbon fibre frame with a USE RX Shokpost. Carbon fibre frame material is also a little more compliant than aluminium. Pictures of some suspension seat posts are just below the Softride frames. Aluminium frames are very stiff and transmit every bit of road shock to the rider’s pelvic area (no good for arthritic hip joints). Which will in time have an effect, a negative one. From my own experience within three months of riding an aluminium frame I developed acute pain in my arthritic hip and found climbing, out of the saddle, excruciating. That problem was eliminated by adding a suspension post. 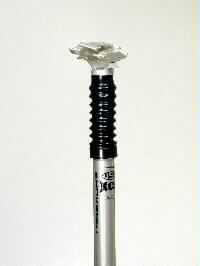 I can still ride a rigid post in an aluminium frame but only infrequently and depending on the road surface for distances between 40 -100km. 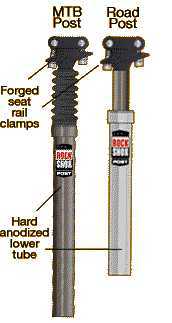 Now there are even suspension saddles on the market which again may eliminate the need to buy a suspension seat post. 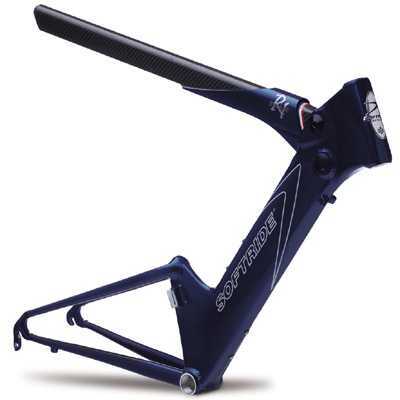 Koobi manufacture a model called the PRS which they claim specifically eliminates the need for a suspension seat post [Triathlon & Multi Sport Magazine Vol. 6 No. 4, April 2003, Melbourne Australia, p.35]. Selle Italia also make a saddle that absorbs shock too. It is called the Octavia. Of course any equipment that makes you go faster for less effort has got to help the overall stress you place on your joints. So the nice to have things like race wheels are going to benefit you just like everyone else. Of course these toys for the bike don’t come cheap but they are very nice to have. Look at things like aerodynamic changes, which includes not just wheels and aero bars but overall bike position and even the frame profile. In non-drafting triathlon the choice of frame design is not limited by UCI rulings (ITU only adopted them for draft permitted triathlons, like formula 1, which are for elite triathletes only), so you can experiment as much as your budget allows. Just remember in any positional changes to accommodate any constraints that you have due to injuries. Comfort has to be included.